US Airways has not left Star Alliance yet, but if you are trying to book a Lufthansa award next year it might as well have. Something very odd is going on right now at US Airways with Dividend Miles agents unable to see any of Lufthansa’s inventory, unless travel commences on a Wednesday or Saturday. Irritated that I continually had to tell clients that US Airways could not book Lufthansa award space, I reached out to Vice President of Corporate Communications John McDonald for clarification. The straw that broke the camel’s back was a business class award I was trying to book for a client from New York to Johannesburg via Frankfurt on Lufthansa. Business and economy class seats were available in StarNet, thus bookable by all Star Alliance carriers including US Airways, but Dividend Miles agents could not see space on either flight in either cabin. My hunch was that, similar to the StarNet blocking United Airlines engaged in prior to its merger with Continental, US Airways was artificially screening Lufthansa space from reservation agents for revenue reasons—put simply, with the glut of US Airways miles floating around and Lufthansa flights offering generous award availability, US Airways was not happy about paying so much to Lufthansa for these seats. As promised, Middelton and her team did reach out to Lufthansa who not surprisingly said it found no issues on their end. “They advised they are not seeing any bugs or issues and the availability seems to working as it should. They said sometimes of course they are not able to accommodate customers because some of the other Star partner are grabbing the seats quicker than others but don’t see any limitations from one system to another on available seats. They also indicated they are constantly reviewing ways to improve their system and will hopefully have some additional tools in April next year.” Clearly, this is not an issue of another Star partner grabbing the seats quicker. If you see Lufthansa award space on ANA’s award search tool and a US Airway agent cannot see the seat, you can request that they confirm the space via a need-need. Middelton stated, “We will continue to book through our availability through Shares. If a customer should request a long sell (which we don’t think happens that often), and the agent actually knows how to do this function we will try to accommodate the request as best as we can.” This is a welcome solution to a problem that has resulted in the majority of intra-European award space in 2014 being blocked. Still, Middelton would not commit to sending a memo or providing clear instructions to agents that long selling is permitted, so most agents are still under the impression they are not permitted to do so. Unless US Airways clarifies this explicitly with agents, it will still be a struggle to book Lufthansa space. Reading between the lines in my conversation with US Airways, it seems clear that whatever the problem in SHARES, it will not be fixed such that agents will again be able to see Lufthansa flights. The odd thing is that not every Lufthansa flights is blocked—for example, I was trying to book a flight from Frankfurt to Venice for next April and over a two-week period each day was blocked except for one Saturday. This despite the fact that each day showed identical I9, X9 availability (indicating at least nine seats were available in both business and economy class) in StarNet. 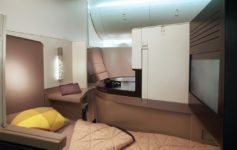 I have given up searching for Lufthansa space when a client comes to me with US Airways miles and that has often resulted in a more circuitous route that presumably ends up costing US Airways more in out-of-pocket expenses. But the Star Alliance network still has 26 other carriers and with the exception of some Swiss and ANA flights that have long been an issue, I am not experiencing any systemic award booking issues outside of Lufthansa. I would still sign up for the US Airways World MasterCard from Barclays with a sign-up bonus while you still can–even without Lufthansa the points are still valuable. I will soon share about the 90,000 mile North-Asia award I booked that includes longhauls on LOT, EVA, Austrian, and Brussels—a tremendous value. But getting around Europe is much more difficult with the Lufthansa spigot closed. US Airways has no incentive to fix a problem that makes it harder for consumers to use their miles, so if you want Lufthansa space in 2014, you are going to have to fight for it. I do not believe that an upsurge in requests for manual requests will cause US Airways to move more swiftly to address this problem, but at least it may orient more agents on the process and help others to get the best value for their miles. I am relieved to hear that US Airways is not consciously blocking this space, even if it is disconcerting that they cannot pinpoint the root of the problem. Previous middle managers below Fern Fernandez were aware of the issue with Lufthansa, specifically denied the inability to book transatlantic first class space was intentional, but intimated they didn’t much mind the glitch. There was at one time a few years ago a memo instructing agents not to long sell. I suspect that the institutional memory isn’t very long here. But it makes sense not to fix the system if they merge with American since they’ll move to the AA platform. Or if they have to bail from Star. If the merger doesn’t go through and they remain in Star, though…. Thanks for that interesting article! what does long-selling mean? @Gary: Even after my conversation with US Airways, the fact that some days are open on LH and most are not harkens back to UA’s StarNet blocking. It makes total sense for US to block seats (countdown to the next 100% bonus promo) on LH and would logically explain this issue. While the middle manager explicitly denied StarNet blocking, when the VP says “what you have experienced is a structural part of the current reservations availability system at US regarding this particular award inventory” that suggests to me that “structural” may indicate some form of intention. Every e-mail exchange was very carefully worded and though I appreciate the willingness now of US to at least say long-sells are okay, it is unfortunate that this problem has gone on for so long. I asked about the deliberate policy choice to not offer Lufthansa First Class space, as the chart indicates, and did not receive a specific response. @Willy: It never hurts to ask, but it will be an uphill battle. I meant it when I say I don’t bother to even consider Lufthansa flights anymore when booking US Airways awards for clients…it makes me look stupid when I have to go back and say the space is not there or even waste the time to call US to check when I no the answer will be no. Just called US Airways, as I was seeing LH availability in Business Class on both united and KVS, but US Airways can’t see availability on that specific date, but can see availability on the day before that. So I asked the agent about “need-need”, long sell, manual requests, and she simply says that is not available. I wonder have anyone has managed to get availability through this process? It’s very difficult…even booking awards for a living I can count on one hand the number of times I have been successful over the years. Matthew, in the USAir partner booking thread on Flyertalk where you posted this article, many have said that Wednesdays and Saturdays seem not to be blocked on LH, while all other days are. I know I gave up when booking an award back in July and am flying US back from BCN (open jaw from Rome) because there was no other way across the pond on a Monday in April. Great post! US agents can’t see some *A partners intra-asia flights available on StarNet. I also ran into some problems booking NH flights during ANA award high season using US miles. Very frustrating. Thanks for investigating it. I personally have 140,000 Dividend Miles left and I wanted to use them for Lufthansa First ideally. Ben mentioned at the last FTU that he still gets US agents to book LH F for him though I thought that was more a myth. Matthew–You, dear sir, have my everlasting thanks for the details on how to do a long-sell for LH flights not showing up on USAir!!!!! I was just able to request and get a long-sell/NN/manual request on an LH flight in business that showed no availability on US, but 2 seats in business and 2 seats in coach on ANA/ExpertFlyer and United.com. It was CLT-MUC on LH 429 in January 2014, as part of a longer itinerary to BKK. I called 4 different agents, and none saw any availability at all on the flight (on a Monday). Frustrated with why they couldn’t see what I could see, I ended up finding your blog here through Flyertalk. When I called the 5th time, I asked up front, before getting into the details of my existing reservation, whether or not she was familiar with doing a long sell and paraphrased your explanation above (including “pinging Starnet”) She said she was not overly familiar with the process, but was willing to give it a try, and seemed to have an idea that LH seats weren’t showing up the “regular” way. She said she would have to cancel all of the outbound flights of my existing reservation (but, importantly, not the return flights) in order to try the longsell. I was feeling lucky, so told her to go ahead and try it. Within a few seconds, the flight, that before had ZERO availability, came back as confirmed in business!!!!! The remaining outbound segments that needed changing, including a MUC-LHR connection, showed up as available (no long-sell required) so she added those to the long-sell seat, didn’t touch the return, and I was able to ticket the whole thing. I did the same thing to a second ticket for the same flight. Again, the CLT-MUC flight was the only one showing as unavailable. She just copied and pasted the same flights, made the long-sell request, it came back confirmed, and ticketed it, too. I was surprised at how quickly both long-sell requests came back. Just a few seconds. My advice is to call at night EST. They seem to be slower at that time, and more willing to try to help. Ideally you want someone who is knowledgeable, but who doesn’t think they know more than you do. It was fantastic to get someone willing to go the extra mile for a customer. Anyway, thanks again for your advice. Something that started out as maddening ended up working out for the best thanks to you. Jim, thanks for sharing and I am ecstatic to hear that you had reached the right agent. Overall, what I had been trying to do now for 2 weeks is book 2 premium class CMB-North America awards. Knowing that SE Asia-Europe was only 120k in first class I attempted to tag on ORD-FRA-ORD, making FRA the destination. I was nearly successful and had I ticketed immediately would have tickets in hand, but I put it on hold and when I called back got a somewhat zealous agent who then actually read the rules. Thanks for the informative, well-written post. After my experience today, I don’t have any more light to shed on the situation, except that it’s as murky as ever! Looked up a bunch of Lufthansa flights using United.com going between JFK-CDG, CDG-LHR, and LHR-JFK. Of course, the agent couldn’t find most of the flights, saying there was no availability even though Expert Flyer and United were showing availability. She was able to find me availability around my dates on Lufthansa that weren’t even showing up on United. Basically, you can’t count on USAirways to be able to get you availability on Lufthansa that you find elsewhere, but you might be able to find availability that doesn’t show up anywhere else. Of course, you’ve got to sit through 2 hours of them telling you a CDG-MUC-LHR booking isn’t legal and that I should find a direct Star Alliance flight…which of course doesn’t exist! Great article and exactly my experience. I have been able to get one long sell for two separate LH flights on same itinerary once. The supervisor was super competent (yes such exist even with US Air) and handled it in 5 min. She even told me they could long sell F. After that no game. Tried a dozen times. No chance. Supervisors basically calling me crazy and they never heard of such a modus operandi.